Below – 25/04/1867 – Fife Herald – New brick and tile works. 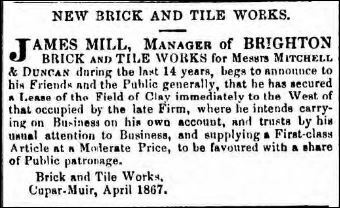 James Mill Manager of Brighton brick and tile works for Messers Mitchell and Duncan during the last 14 years, begs to announce to his Friends and the Public generally, that he had secured a Lease of the Field of Clay immediately to the West of that occupied by the late Firm, where he intends carrying on Business on his own account, and trusts by his usual attention to Business, and supplying a First-class Article at a Moderate Price, to be favoured with a share of Public patronage. Brick and Tile Works, Cupar-Muir, April 1867. 03/09/1868 – Fife Herald – Bricks, tiles, drains and ditch pipes. James Mill begs to thank his friends and the Public generally for their kind support since he commenced Business, and to intimate that he is now in a position to supply large or small orders for Drain or Ditch Pipes, Common Bricks, Pavement Bricks, Roofing Tiles, &c ; and anything not generally kept in stock made to order on the shortest notice. The goods are all manufactured under his own personal superintendence. The quantity of the Goods of his manufacture require no commendation to those who have already used them, and those who have not need only to give them a trial. Fire Bricks ; Sewerage Pipes, Common Red Clay, Chimney Cans, and Fire Clay Cans, plain and ornamental, also kept in stock ; and any article of Fire Clay manufacture supplied. All orders punctually attended to. Cupar Muir Tile Works,Cupar. 12/06/1873 – Fife Herald – Reduction the Hours of Labour.— The employe’s of James Mill, Cupar Muir brick and tile works (numbering upwards of fifty hands), waited upon their employer the other day and asked reduction of their working hours from 57 to 51 hours per week, without any reduction of pay. The workmen at Brighton Tile Works (Messrs Duncan & Son) also made like demand, and in both cases the request was granted. 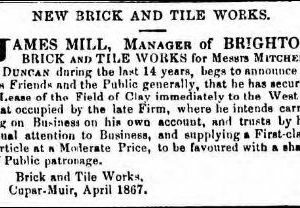 11/03/1885 – Fife Herald – Brickmakers – wanted. A brickmaker. Apply J.Mill, Cupar- Muir Brick and Tile Works, Cupar Fife. 1893 – 1896 – Cupar Muir Tileworks. J Mill Brick and Tile Manufacturer. 24/06/1899 – Dundee Advertiser – New public companies. 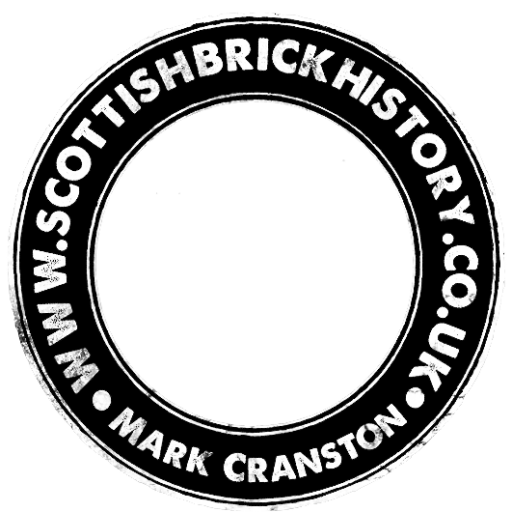 The Fife Brick and Tile Company – to carry on the business of coalmasters and traders in bricks, tiles etc. Capital £10,000 in 1000 shares of £10 each. 03/02/1900 – St Andrews Citizen – Painful Accident to a Boy at Cupar- Muir Brick Works. —On Wednesday evening a distressing accident occurred to a lad of 14, Duncan Jamieson, employed at the Fife Brick amd Tile Works, Cupar-Muir. By oversight he stepped into the pit containing the machinery for mixing the clay, and before he could be extricated he was severely injured by the knives. One of his feet was almost severed from the leg, the bone of the leg was broken, and the knee dreadfully lacerated. Several medical men were soon on the spot, and in accordance with their advice, the lad was sent by the 9.21 train to Dundee Infirmary. 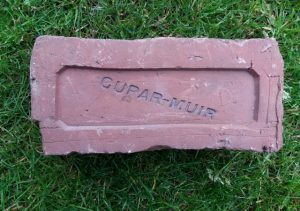 21/09/1901 – St Andrews citizen – The Fife Brick and Tile Company Limited – Cupar Muir Brickworks, Cupar Fife, have common red and pressed brick, drain pipes and roofing tiles always in stock. 14/04/1903 – Dundee Evening Telegraph – Failure of a law firm. It has been announced that Mr G W Bruce, solicitor is in financial difficulties. He has interests in many businesses including the he Fife Brick and Tile Company Limited, Cupar Muir. Next Article Arniston Coal, Lime & Brick Works, Gorebridge, Midlothian. Trafford Bank Brickworks, Cupar Muir. 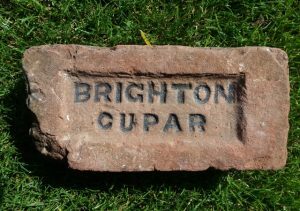 Found in Fife by TS Cupar Muir Tile Works, Cupar, Fife . . . .
Found Dundee Henry Duncan and Sons, Brighton Brick and Tile Works, Cupar. . . . . .